Reach your ideal weight with ease and seamlessly transfer data directly to your smartphone using Bluetooth technology with the Beurer Bluetooth Glass Body Fat Bathroom Scale. 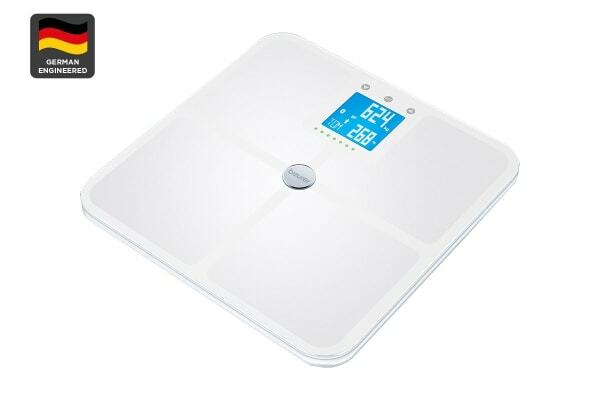 The Beurer Bluetooth Glass Body Fat Bathroom Scale accurately measures body weight, body fat, body water, muscle percentage, bone mass; AMR/BMR calorie display and includes a BMI calculation. The easy-to-read 2-line display appears in a modern dot matrix look with illuminated digits and the display includes the user’s initials for easy reference. The Glass Body Fat Scale also features an LED motivator: easy, colour-coded feedback for achieving targets and to help keep you on track. The pregnancy mode feature allows for controlled weight gain during pregnancy without BIA (Bioelectrical Impedance) analysis for safe usage.